▷ Best Top 5 Rated Air Fryers February 2017 | First-time Buyers Guide! Do air fryer cooks fries evenly? Air fried fries vs oven fries. For years, Philips Airfryer dominates the hot air fryer market. The name ‘Airfryer’ even developed to a generic brand. Airfryers has now grown into veritable mini-ovens in which the most varied dishes are prepared. At first, they were designed as a healthier alternative to the fryer because your fries is prepared in hot air instead of fat. Depending on the type of fries, the airfryered fries contain about 5% fat and deep-fried fries about 13% after preparation. But there are also disadvantages. Airfryers are not prepared for big eaters. In most of the test, it fits a maximum of about 800 to 1000 grams of frozen chips, with some peaks up and down. As an indication, with about 300 grams of fries, you have a full plate. We do the testing in two amounts of fries: the amount of frozen fries in accordance with the instructions, and the amount that provides the best fries. If the manual doesn’t give any indication, we will take two-thirds of the maximum amount. As expected, we achieve the best results with the “optimal” amount, except for Philips Airfryer XL, HD9643 and HD9220 and the Tefal Actifry XXL. Apparently, these brands know how to deal with a large amount of fries. With most devices, you can only heat 500 grams of fries at a time for an acceptable result. For a new portion, you have to wait for another 15 to 30 more minutes. The Montana Master Fryer 199XL is the slowest: for about 600 grams it does half an hour and about 1200 grams even 37 minutes. Although originally intended as a fryer-alternative, most air fryers struggle to make really tasty usual frozen fries. The biggest problem is heating evenly. Although we toss the fries after every five minutes, one part remains pale and limp, while other fries are crisp and even burnt. The Tefal Actifry and the De’Longhi’s create fries with a stirring blade, making them much more evenly baked. But ultimately only the Philips Airfryers HD9643 and HD9220 baked in look and texture something really acceptable from ordinary frozen fries. Oven fries are in the air fryer much better than frozen fries. The oven fries from Philips HD9643 even get a 10 for their flavor and look. Because the regular fries were still quite nice in this fryer, we find the best HD9643 fryer in our test. 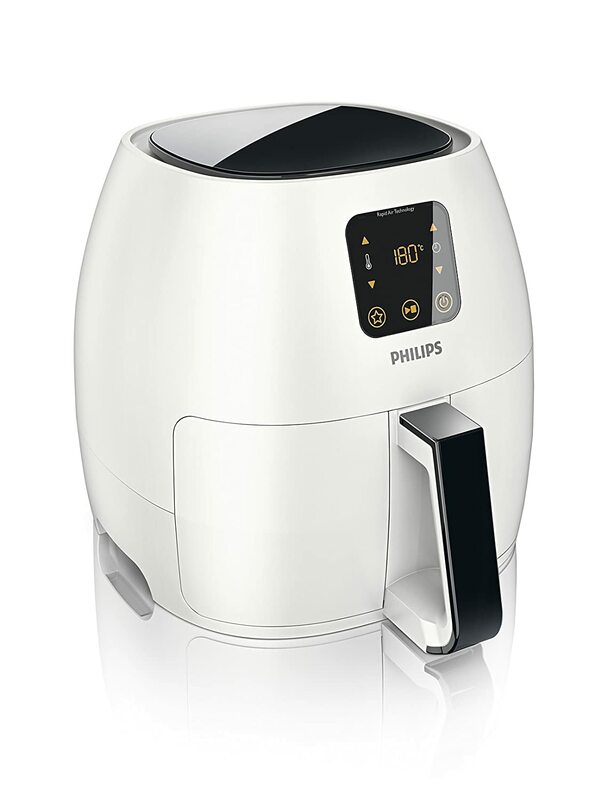 Philips has equipped the device with a new technique that would make fries ‘better’ than those of the previous generation Airfryers. Too bad that it consumes so much energy and not that fast. Kindly note that oven fries have a special coating which makes them have more calories than regular frozen fries from the airfryer. Airfryers are big energy-hungry appliances. Only 5 devices score above 6 for power, 12 devices even remain under 5. On average they use between 0.43 and 0.57 kWh per preparation. Both Montana-models use the most power: baking maximum portion of French fries for 1200 grams takes the 199XL nearly 1 kWh. This is the same for an average washing machine to washes almost a full wash at 40 ° C. The most economical models are those from Fritel. This model only uses a third of how much the Montana’s needed for almost the same amount of fries. Since you don’t work with hot oil, air fryers are less dangerous than oil-fryers. But the air from the air outlet at the back is very hot, so keep enough space on the back of the appliance. Also, they can become hot at the front. Airfryers are easy to use. The simplest models have rotary knobs for temperature and a timer. It is a pity that you often can not set an accurate time. Whit the Tefal Delight, Bestron ASF1304Z, Inventum GF400HL and Philips HD9220 can not turn back the time button if you have turned it too far. Very annoying. Some models have a digital display and touch control. The Philips Airfryers with a digital display works well. Because the devices doesn’t have any hot oil, they are much easier to keep clean than normal fryers. But be careful with dishes that can leak like meat, drumsticks, vegetables and other dishes with a lot of moisture or grease. 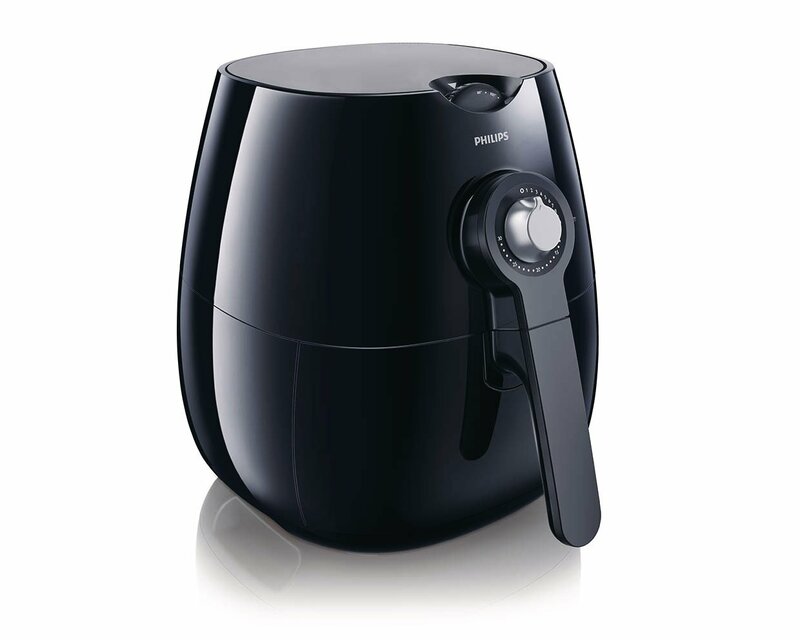 Airfryer users report that the parts are difficult to clean if you don’t clean it as soon as possible after the preparation of leaking or oily dishes. A number of fries that gives the best baking results, according to the manufacturer. Or if that information was missing: two-thirds of the maximum amount of fries. The maximum amount specified by the manufacturer. We set the devices on the right temperature and baking time, which is advised in the manual. On appliances without a rudder, we shake the fries every 5 to 7 minutes, even if it is not in the manual. After the recommended time we get the fries out and we judge them by their look and texture. We do this in three rounds. During these tests, we measured the temperature inside and outside the unit including energy consumption and cooking time. We also bake croquettes, following the instructions on the packaging of the manufacturer (to prepare the croquettes in the air fryer). The croquettes we judge after heating based on their look and crispiness. Most air fryers have difficulty with regular frozen fries. The biggest problem is that the fries is baked unevenly: some are mealy and limp, while others are crunchy or burnt. Regular tossing fries helps during baking. Airfryer which stir fries with a rudder produce fries which is cooked more evenly. Oven fries come out in most air fryers a lot better than regular frozen fries. You’ll get the best result if you do not make too big portions. In most air fryers this means no more than 500 grams to 750 grams of baking fries at once. 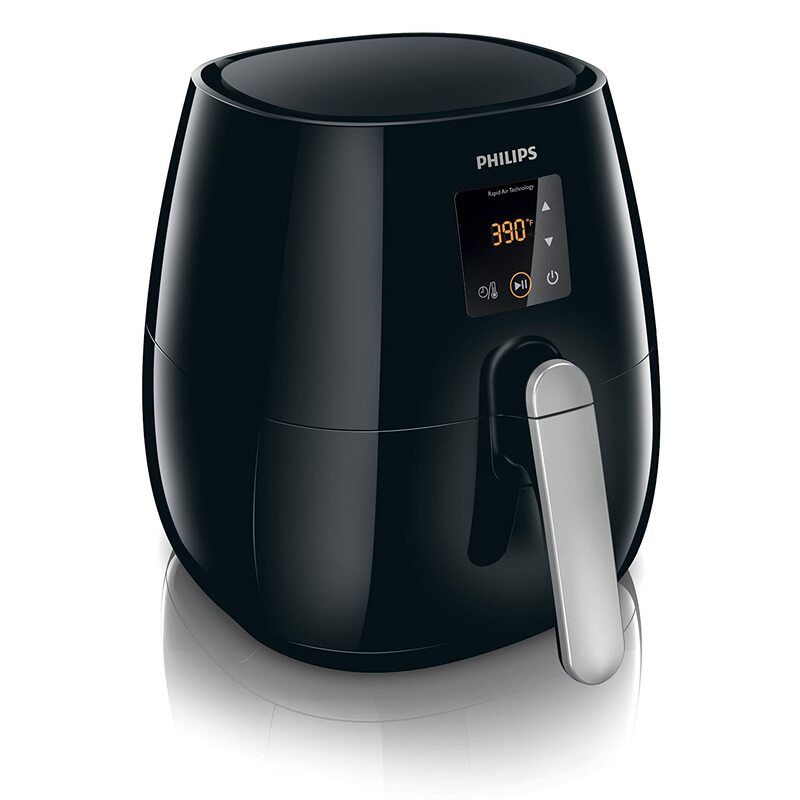 The best air fryer in the test is the Philips Airfryer XL HD9240/90. It comes in different colors, with different prices. The Philips Airfryer XL HD9240/90 is one of the few air fryers which scores higher than average for baking frozen fries. The Philips Airfryer XL HD9240/90 is also the best choice for large fries eaters: he obtains the best results for cooking a large amount (1000 g) of fries at once. The Philips Airfryer XL HD9240/90 is also one of the fastest air fryers. However, it consumes a lot of power: a kilo of fries baking takes 0.5 kWh or a dime for electricity. And the front of the tray is pretty hot. It is also one of the easiest air fryers to use: manual and controls are clear and simple, and all the spare parts are dishwasher safe. The best French fries are made by Philips Airfryer HD9643. This air fryer uses a new technique for heating fries ( “Turbo Star”) and it really shows in our test: it’s one of the few air fryers which bakes regular frozen fries quite tasty and oven fries even get a 10 for their taste and look. 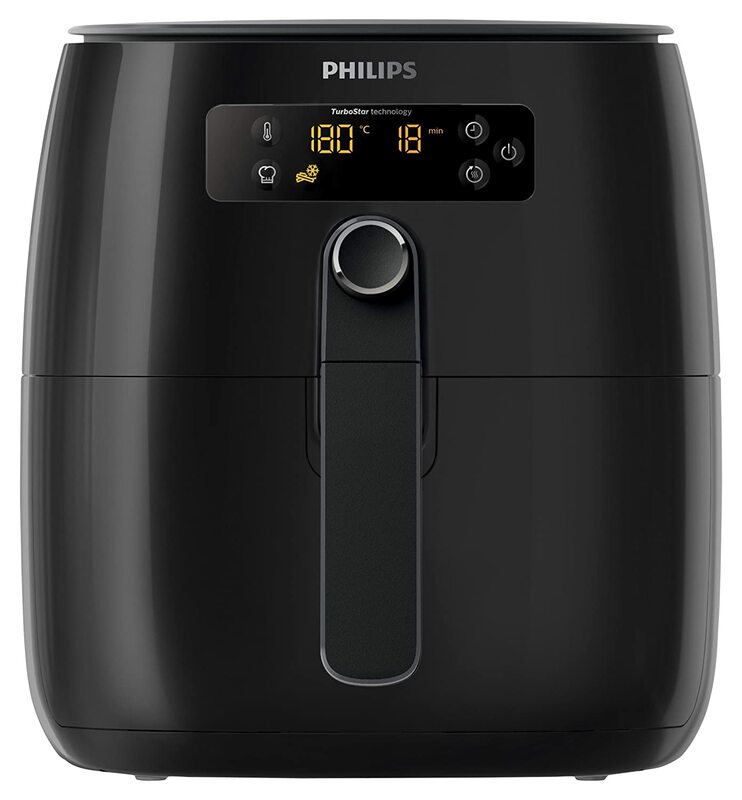 But because this air fryer uses for 800 grams fries as much power as the Philips Airfryer XL HD9240/90 for 1000 grams and because he needs quite a lot of time, it is not our choice for Best Tested. The Philips Airfryer XL HD9240/90 finishes with a normal portion of French fries in 12 minutes – not counting the startup heating time. Do you want to have as many fries as fast as possible, then you’ll need the Philips Airfryer XL HD9240/90 : which does 16 minutes for 1000 grams fries, which also is not bad. ← Best Wireless Bluetooth Speakers 2017 – BUYER’S GUIDE!